Need more information about booking Home 6816080 ? Modern double bed studio with bath/shower room and open plan kitchen/lounge. Beautiful seaviews over the fleet and jurassic coast. Only 2 miles from Weymouth beach and a few strides from the south west coastal footpath. We are in walking distance of 5 public houses and restaurants and have ample parking. Local fish and chips and Pizza available in the summer at the bottom of the hill. If your here for the breathtaking seaview walks or the attractions that weymouth has to offer you have found the right place. Afraid no wheelchair access as only entrance is outdoor stairway up to the building. We have a bus route at the end of the lane, routes to weymouth beach, Bridport, Yeovil and Lyme are all accessible. Train station in weymouth town and many taxi ranks. I tend to be working a lot so will leave you to it but am always on the end of the phone if there's a problem. This Studio has 1 bathroom and sleeps 2. It’s been listed on Holiday Lettings since 09 Oct 2015. Located in Weymouth, it has 35 reviews with an overall rating of 4.5. The average weekly rate varies from £338 to £470. Comfortable, with great views, good location for walking and exploring, everything we needed for our self catering break was all to hand, the owners arrival instructions were spot on and we were left to enjoy our holiday. The apartment was totally relaxing, clean, fresh and was well equipped for all our needs. There are written files that recommend places to visit and how to get there and bus time tables. As stated in the write up there are plenty of shops/restaurants and pubs in the area as well as the bus stop just over the road into town (which we did on several occasions) We would highly recommend this place especially for anyone who loves the outdoors and picturesque views. Owner's reply: Thank you for your lovely review, we are so glad you enjoyed your stay and would love you to come visit us again. All in all we had a fantastic stay at the Apartment. One or two niggles though. On entering the Apartment you are greeted with a strange smell. Possibly coming from garage below???? The shower proved quite difficult to regulate just as you got it hot enough and got in it continued to get hotter and then when you turned it down a notch it got cold very quickly. But we managed. Also went into garden to hang walking gear on rotary drier only to be greeted with large amounts of doggy doo doo . Wouldn't have wanted to sit in garden with that even if weather had allowed. But was very comfortable apartment. Well equipped kitchen. 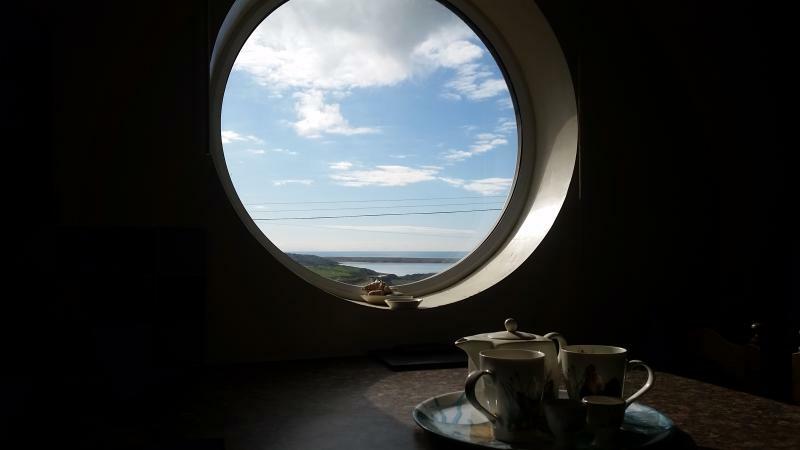 And great view of the sea through the pothole window while eating your breakfast. Lovely little studio, the pictures don't do it justice. Everything you need, well equipped and cosy. Location great with bus stop 2 minutes away with direct transport to town centre, however taxis just as cheap so we used them. Close to supermarket for all your needs. Lovely view from the kitchen/dining area. Met Nicky briefly, lovely friendly lady. Would definitely re-book here as I will be going back. Lovely weekend away and miss it already! we have had a fantastic week.This little flat is perfect it has got everything you need incuding a fantastic view to wake up to every morning. We will definitely be coming back. Great location and wonderful views,Nicky was always helpful and prompt with any information or help needed,everything you need for a short break away. We will book again! Perfectly situated away from the hustle and bustle.Very peaceful as no through traffic .The apartment is well equipped with all that is needed for a comfortable stay for a short winter break. Owner's reply: Thank you for the lovely review. Cosy , clean and all facilities provided.not far from beach, lovely view. Definitely recommend and will stay there again. Owner's reply: Thank you for the review. We look forward to seeing you again. Good Value, nice accommodation. Close to amenities and bus route to Weymouth. Would definately recommend. Owner's reply: Thank you for a lovely review. You can get in touch with Nicky (the owner) through the contact form on this page. Send Nicky (the owner) an email through the contact form on this page. Alternatively, if there’s a phone number on this page, you can call them. How do I contact Nicky (the owner)? If you’ve already booked, go to Manage your holiday booking to view Nicky the owner's contact details or send them a message. Or send Nicky (the owner) an enquiry through the Contact the owner/manager form if you’d like a quote or more info first. When you pay online through the Book your stay form, a booking request is sent to Nicky (the owner). You’ll find out within 24 hours whether they’ve accepted - no money will leave your account before then. You can also request a quote from Nicky (the owner) through the contact form. The owner will email you the total cost for your dates and a link to book and pay online. Use the Book your stay form to pay provisionally online. You can pay by credit/debit card or PayPal. Nicky (the owner) will have 24 hours to accept the booking and no money will leave your account before then. Why can't I call Nicky (the owner) before booking? You’ll need to contact Nicky (the owner) to do this. Send them a message in Manage your holiday booking or through the contact form on this page. You can request to change the dates or number of people on your booking via the Manage your holiday booking page. To change your holiday dates use the Edit booking button. If you need to change the number of guests staying then send Nicky (the owner) a message. If Nicky (the owner) agrees, they’ll send you a revised quote outlining the changes. You can review and accept/decline this from the Manage your holiday booking page. You’ll have 48 hours to take action before the revised quote expires.